We are saddened to report that another fellow Hoosier cyclist lost his life while riding his bicycle. A resident of Middlebury, Indiana in Elkhart County, Elmer Miller, was riding his bicycle on the shoulder of U.S. 20 near the town of Middlebury, Elkhart County, on July 24, 2013 around 4:30 a.m. when he was struck by an SUV. The Elkhart Truth reported that a 20 year-old man was driving the SUV and left his lane, striking Elmer Miller in the process. Elmer Miller even had flashing lights on his bicycle as required by Indiana bicycle law at the time of the collision. Some people may be wondering: is it legal for a cyclist to ride on highways in Indiana? Indiana Code 9-21-11-2 provides that a bicycle can be operated on any Indiana roadway. Indiana’s definition of “roadway” (found under Indiana Code 9-13-2-157) does include highways; further, Indiana law specifically sets forth that bicycle riders who operate on highways must abide by all relevant Indiana bicycle laws (Indiana Code 9-21-11-11). Therefore, the answer to previously posed question is YES – cyclists have every right to ride on highways. It is important to note that every Indiana municipality can enact its own ordinances related to bicycle safety. If you have a question about your municipality’s bicycle ordinances, Contact Us and we will be happy to discuss it with you. In addition to the fatal bicycle accident involving Elmer Miller, a pedestrian in Indianapolis was struck by a vehicle around 6:07 a.m. on July 23, 2013 on the southwest side near the 8600 block of Cox Road. That same day, at 6:13 a.m., a bicyclist was struck at the intersection of Harding and Morris in Indianapolis. To top it off, a different pedestrian was struck by a motor vehicle in downtown Indianapolis at 6:25 a.m. near the intersection of Washington Street and Capitol Street. These pedestrian vs. motor vehicle and bicycle vs. motor vehicle accidents all caused injuries. Fortunately, none appeared to be life-threatening. At Caress Law Group, our Indiana Bicycle Collision Lawyers help clients involved in bicycle and/or pedestrian accidents in Indiana. These accidents occur far too frequently. We would encourage anyone on a road, whether a cyclist, pedestrian, or automobile, to check your mirrors before turning and to leave 3 feet of space when passing a cyclist or pedestrian. Accidents are bound to happen, but we can minimize these often-deadly bicycle accidents if we take the proper precautions. Caress Law Group’s bicyclists send our very best to the family of Elmer Miller. Our thoughts and prayers are with his family and all that knew him. We will continue to advocate for bicycle safety so that devastating accidents like the one involving Elmer Miller can have a better chance of being avoided altogether. If we can assist you in any way, please feel free to call us at 317-255-5400 or by clicking Contact Us to submit an online, confidential, and free inquiry. Back in April, Caress Law Group’s Indiana bicycle crash lawyers posted an article about the City’s plan to implement bike boxes in select spots throughout Indianapolis. You can read this article by clicking: “Indianapolis to Implement Bike Boxes.” Today, however, we are proud to announce that the first bike boxes in Indianapolis have been completed and are currently being used by bicyclists. 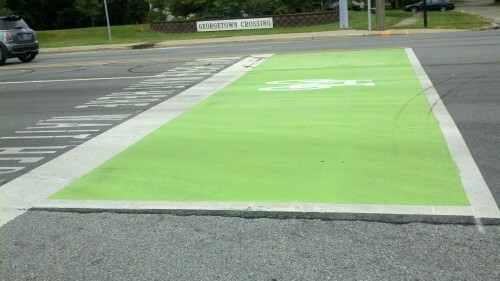 Thanks to UrbanIndy, we now know the first bike boxes are located at the intersection of 71st Street and Cross Key Drive as well as 73rd Street and Cross Key Drive. 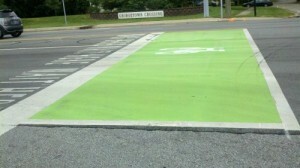 These two bike boxes have been painted green and are now ready for use. For more information about these Bike Boxes, check out our previously written article. Our bicycle lawyers hope that the utilization of these bike boxes will decrease bicycle vs. motor vehicle accidents, but this is an important trial period currently taking place where city officials will be able to determine whether they help or not: the verdict is still out on the bike boxes. If you have any questions regarding Indianapolis Bike Boxes, anything having to do with Indiana bicycle law, or any question regarding Indiana personal injury or medical malpractice law, feel free to call us at 317-255-5400 or send us an online inquiry here. We are always happy to assist, and we hope you enjoy your next ride! A Lebanon, Indiana resident and former high school swim coach died in a tragic bicycle crash on Saturday morning, July 20, 2013. Duane Swisher, 55 years-old was riding his bicycle in the area of Indiana 32 and U.S. 341 near Jackson, Indiana, which is about 20 miles west of Crawfordsville, Indiana. As he was riding around 8:28 a.m., Duane Swisher was struck by a motor vehicle, believed to be a Jeep, and was taken to St. Elizabeth Hospital in Crawfordsville where he was pronounced deceased as a result of the bicycle accident injuries he had sustained. The cause of this collision is still under investigation. To add to the tragic events that occurred in central Indiana over the weekend, an Indianapolis pedestrian was hit by an automobile near 21st Street and Meridian Street around 4 p.m. on Friday, July 19, 2013. The Indianapolis pedestrian was taken by ambulance to a local hospital in serious condition, but fortunately, his status was updated to good after receiving treatment at the hospital. Police blocked the 21st and Meridian intersection for about an hour after this incident. The cause of this Indiana pedestrian accident had not yet been revealed to the public, and no further information has been released at this time. Both of the above-referenced collisions are prime examples of just how exposed bicyclists and pedestrians are on the open road, particularly when involved in an accident with a motor vehicle. The consequences of such crashes can be devastating, which is why it’s so important to be careful when on the road, whether in a car, on a bicycle, or on foot. In most cases, our Indiana bicycle lawyers have found that accidents like these could have been avoided had one or both of the parties been more careful and cautious in the operation of their car or bike. Caress Law Group’s Indiana bicycle accidents attorneys and Indiana pedestrian lawyers are very sorry to hear of the loss of Duane Swisher in this tragic bike accident. We have seen the number of accidents involving bicycles and pedestrians sky-rocket over the last couple years. We would encourage all on the road to review the Indiana bicycle laws and to make sure when you’re out there, “share the road” and leave at least 3 feet when passing a cyclist in a motor vehicle. Our sincerest thoughts and prayers are with Mr. Swisher’s family and all those in the Lebanon community who knew him. At Caress Law Group, we frequently see how the use of bicycles can change a person’s life in an instant. With a portion of our practice dedicated to representing injured bicyclists, our Indiana bicycle lawyers know that a rider’s favorite hobby can take a dangerous turn as a result of someone’s brief moment of carelessness. However, make no mistake; cycling brings great joy, pleasure, and self-satisfaction to riders an overwhelmingly majority of the time. Recently, for example, there have been a number of inspirational stories from Indiana news outlets describing Hoosiers utilization of bicycles to show appreciation, raise money, and, generally, to make a positive impact in the community and beyond. Jesse Beller and his cousin Garrett Caldwell used their bikes to show gratitude for the assistance of the American Cancer Society, an organization that supported their grandmother during her successful battle against breast cancer. On July 6, 2013, these two college-aged men began their 700 mile bicycle journey in Jasonville, Indiana with the intention of pedaling all the way down to Fort Walton Beach, Florida. These dedicated young men wanted to use their passion for bicycling to raise money for the American Cancer Society after all the organization did to help their grandmother, and the ride seemed to have been a great success. The Cops Cycling for Survivors Foundation began its inaugural Indiana bike ride in 2012, but last year’s journey was such a success that it has made great strides in 2013. Cops Cycling for Survivors is another example of Hoosiers using their bicycles to show support for the community; in particular, this bicycle ride across Indiana consists of active and retired police officers, law enforcement survivors, family members, and friends to pay tribute to Indiana law enforcement personnel who have died in the line of duty, to raise funds, and to promote awareness of the sacrifices made by Indiana law enforcement members and their families. Riders participating in this event are riding their bikes around the perimeter of Indiana, a 962 mile bike ride. Just recently, you could see these bicyclists pedaling through Dubois County, Vigo County, Sullivan County, and Princeton, Indiana. Riders in this event are expected to finish their 962 mile trek this weekend in Indianapolis. On a lighter note, singer Dave Matthews was riding his bicycle in Hershey, Pennsylvania this past weekend when his bike tire went flat. Two Dave Matthews Band fans happened to be driving by and helped him fix his flat tire. Dave was so appreciative that he gave the couple back-stage passes and front row tickets for the show in town that weekend. The moral of the story is, when you see a biker in trouble on the side of the road, it might be worth it to stop and help – you never know what you might get out of it! The Indiana bicycle accident lawyers at Caress Law Group are truly proud to represent victims of bicycle injuries in Indiana. It is for that reason that we are also proud of Jesse Beller, Garrett Caldwell, and groups like the Cops Cycling for Survivors Foundation. While riding bicycles are a hobby for many, it is also a strong passion for many others, and Caress Law Group supports and will continue to support such endeavors. We like to cycle ourselves, so we understand the occasional urge you might have to get out on a new pedestrian and bicycle-designated trail. If you live in Indianapolis or central Indiana, you probably ride the Monon Trail, Cultural Trail, or Fall Creek Greenways on a fairly regular basis. While all these bike paths are tremendous for biking and exercising with amazing views of the city, there are other bicycle trails throughout the State of Indiana that provide great biking experiences and are also very distinct from trails like the Monon. While our Indiana bicycle lawyers at Caress Law Group are committed to providing aggressive representation on behalf of injured bicyclists in Indiana, we also advocate for Indiana bikers to have the best riding experience possible. For that reason, we have provided a link on our website that lists some of our favorite Indiana bike routes and trails for readers to peruse, research, and eventually get out on and ride. We have always had a great time when we plan a bike trip weeks in advance to ride one of the trails that are an hour or two away from Indianapolis. This journey might take you to a part of Indiana that you have never before been. Indiana’s unique landscape and beauty lends itself well to adventurous bikers – and we would recommend taking a look at some of these bike routes and maybe planning a trip in the future. 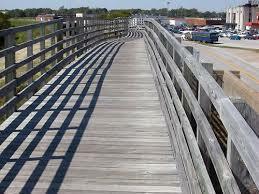 One of our bicycle accident lawyers’ favorite bicycle paths is the Nickel Plate Trail that runs from near Kokomo, Indiana all the way to around Rochester, Indiana. In between, you will pass historic Indiana towns like Bunker Hill, Peru, and Denver. The scenic beauty along this trail is difficult to put into words, so you will need to bike this trail yourself to find out! Another personal favorite of ours is the Oak Savannah Trail in northwest Indiana. This path runs through Lake County, Indiana and Porter County, Indiana and extends from Griffith, Indiana to Hobart, Indiana. This 8 mile trail will take you through some of the area’s historic sites, like old bridges and downtown areas with very welcoming small shops and restaurants. Feel free to scan through some of the trails we have provided for our readers by clicking here. Also, if you decide to ride one or more of these Indiana bicycle routes and would like to ride in style, request a free Indiana bicycle flag patch or sticker. Our bicycle attorneys want to promote the use of bicycles in the great State of Indiana – so we would be honored to provide you with this free merchandise! If you have any questions about this post or any questions regarding Indiana bicycle or law or personal injury law in general, don’t hesitate to call us at 317-255-5400 or by clicking to submit an online inquiry. Two more Indiana bicycle collisions have recently been reported. On June 30, 2013, a Columbus, Indiana woman was airlifted to a hospital after crashing her bike on a mountain trail near Charleston, West Virginia. News reports indicate that this fellow Hoosier sustained severe injuries to her neck and back after crashing into a small tree. Luckily, this woman survived but is now working on recovering from the bicycle crash injuries she sustained. A Mishawaka, Indiana man was not so lucky. Timothy Grant, a 54 year-old resident of Mishawaka (near South Bend, Indiana) was riding his bicycle on June 22, 2013. Mr. Grant was headed to work and was even following Indiana bicycle statute by displaying a flashing red light on his bike when he was suddenly struck by a Dodge Charger that was being operated by 22 year-old Brandon Gonzalez. Mr. Gonzalez, a US Army veteran, struck Mr. Grant near Penn High School and instantly killed Mr. Grant, who was wearing a helmet at the time. Brandon Gonzalez attempted to flee the scene of the bicycle crash, but police were able to locate him with the help of witnesses. Mr. Gonzalez faces charges of hit-and-run leaving the scene of an accident resulting in death, operating while intoxicated causing death, and leaving the scene after operating while intoxicated causing death. The bicycle accident lawyers at Caress Law Group extend our thoughts and prayers to the family of Timothy Grant and wish a fast recovery for our fellow Indiana resident injured in Fayette County, West Virginia. Unfortunately, we hear of similar news far too frequently, and these bicycle wrecks in Indiana are almost always the result of negligence and/or carelessness on the part of either an automobile driver or another bicyclist. Many Indiana cities and towns, including Indianapolis, West Lafayette, South Bend, and Fort Wayne, among others, have recently enacted local bike laws and ordinances that require drivers to leave 3 feet of space when passing a bicyclist on a roadway. This “3 foot rule” in Indiana is an attempt to instill the mindset of all on the road – whether motor vehicles, bicycles, or pedestrians – to “share the road” and to be safe to avoid injuries and deaths like the ones reported above. At Caress Law Group, our attorneys devote a significant portion of their practice to representing injured victims of bicycle crashes. As cyclists themselves, Tim Caress and Lance Worland understand the vulnerability of bicyclists out on the open road. If you or a loved one has been injured in a bicycle accident in Indiana, feel free to call us for a free discussion of how can help at 317-255-5400 or by clicking Contact Us. We take pride in obtaining settlements, verdicts, and justice for our clients – and we look forward to helping you or a loved on his or her path to recovery. Caress Law Group’s Indiana bicycle lawyers are always excited to announce new developments that improve bicycle access in Indiana. It was not that long ago when newsworthy information regarding updates to Indiana’s bicycle infrastructure was extremely rare; however, times have changed, and we applaud the City of Carmel for the continuous bike-friendly improvements that it continues to announce. 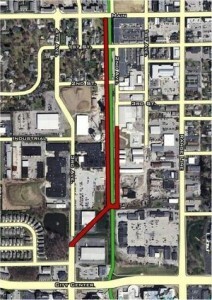 The City of Carmel has unveiled the beginning stages of an area they plan to call “Monon Boulevard.” The main aspect of this Monon Boulevard that will be of interest to bicyclists is an expansion of the Monon Trail that will occur along this area on both sides between Main Street and City Center Drive in Carmel. This area will provide bike lanes on both sides as well as separate areas for those wishing to run, walk, or jog. Additionally, this are promises scenic landscaping, which always makes a bike ride more enjoyable. Carmel Mayor Jim Brainard notes that this area was once an old industrial area, but the expansion of the Monon Trail here will give the area a fresh development in an already modernized area. 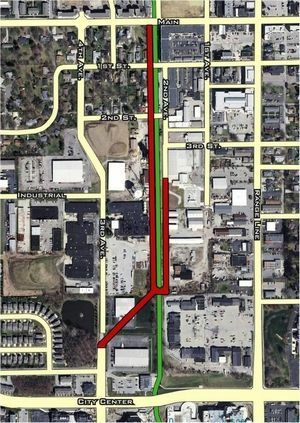 The Indianapolis bicycle accident attorneys at Caress Law Group believe this expansion of the Monon Boulevard will be beneficial to the community. We have seen a number of cyclists injured as a result of other bikers and motor vehicles during the spring and summer seasons in central Indiana. While these bicycle crashes can happen anywhere, cyclists should feel safer when they are on a trail designated for use by bicyclists and pedestrians, much like the Monon Boulevard. However, we urge riders who are using these designated trails to ride within reason. Many of the bicycle wrecks we have seen are the result of bicycles colliding head-on with one another on trails and greenways. We advise you to ride at a reasonable pace and be sure to look out for others on the roadways and trail ways when riding. The Indiana Bicycle Layers at Caress Law Group in Indianapolis are the local leaders in bicycle insurance claims and lawsuits. We take great pride in representing injured bicyclists to the best of our ability and making sure that you are properly compensated for any medical bills, lost wages, property damage, and pain and suffering. If you have any questions or comments about Indiana bicycle or other injury law, please contact our premier Indiana bicycle lawyers Lance Worland or Tim Caress at 317-255-5400 or click Contact Us. All calls are free and easy – we look forward to hearing from you!